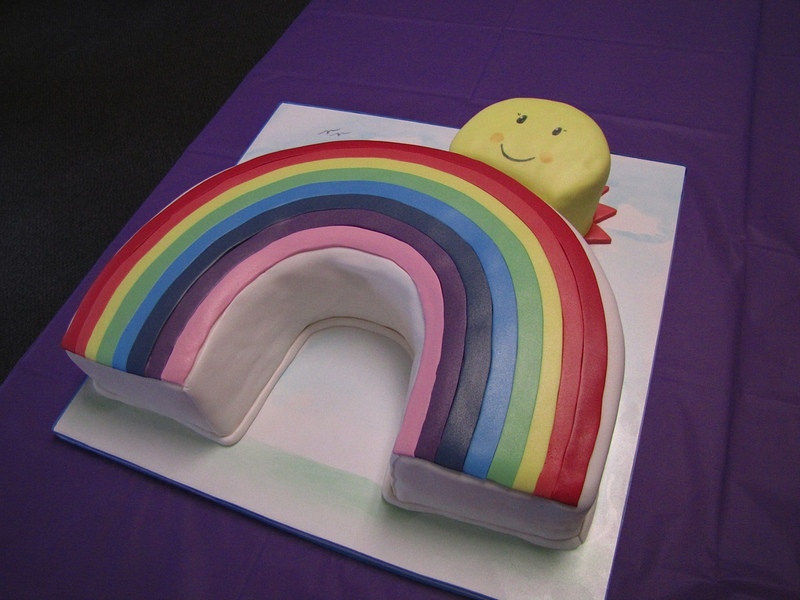 The rainbow cake created by Sin Desserts. When our daughter tells us she wants a rainbow cake for her birthday, we take such a request seriously. Geoff researched making one like this, but quickly realized we had enough to do without cake baking (when Geoff made our wedding cake, he spent weeks refining a recipe). So we turned to Sin Desserts in Providence who with about a week’s notice exceeded our expectations. Not only did they make a rainbow cake, but they added a smiling sun with the cut-out semicircle (Madeline requested her first piece from there) and a drawing of blue sky and puffy clouds on the tray below. The hard crust of the fondant kept the chocolate cake and whipped cream layer inside perfectly moist — and also ensured that Madeline’s anticipatory poking did no harm. Usually cakes this pretty are awful, but I have to say this was an exception — the cake was light with a great chocolate flavor. Although I did skip eating the fondant, I have to admit — that stuff just doesn’t seem edible. 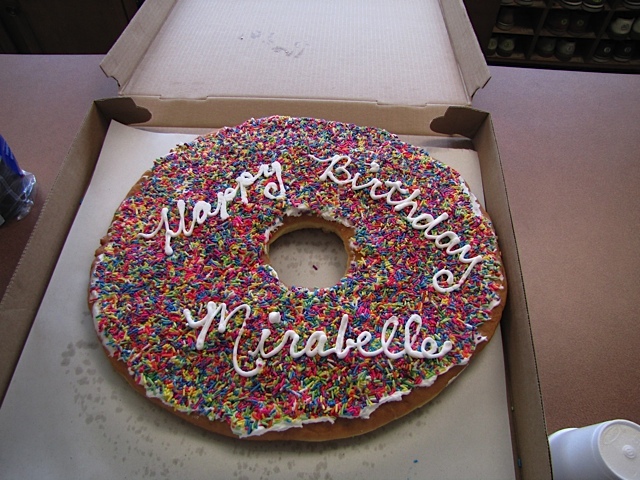 Finally -- an occasion to order an Allie's Donuts donut cake! Thinking that the cake would feed about 30 small mouths (turns out it was more like 60), we also ordered a donut cake from Allie’s Donuts which we’ve been wanting to do since our first visit there a few weeks ago. At first, I had no idea what could possibly be inside the pizza-sized boxes emerging from the donut place, but it turns out it’s a giant donut. Genius. When Geoff called to order it, they wanted to know exactly what time he’d be by to pick it up — it turns out they were going to make it immediately before to ensure the maximum freshness possible. And it showed — it was so soft, it practically melted in your mouth. I personally could have done without the rainbow sprinkles, but it wasn’t my birthday. We froze some of the rainbow cake, but the donut cake has been eaten, and I’m now awaiting the next appropriate occasion for one. Also read a blog post from our first visit.